Vaughan Willard Public School, Pickering, raised $257.34 The Student Council of Vaughan Willard Public School in Pickering is made up of a committed and talented group of Grade 7 and 8 students. The Council organizes dances and school events, the proceeds of which go to fund projects that work towards the council’s mission statement. Their mission is to improve the quality of life of students within the school, as well as their local and global community. Students decided, after hearing about the Creation of Hope project at a Literacy Day Event, to donate their remaining funds to the community of Kikima in Kenya. The Student Council would like to see the funds go towards any current project that would benefit from financial support. St. Benedict in Sudbury $135.99, including a $20.00 donation from Chanelle – who came up right after a presentation and gave me the money. Funny, she thinks that I inspired her – she inspired me. It’s this generous nature that gives me the energy to continue to move forward. Chaplain Rob Pappin was a driving force behind taking these donations. Andrew Dilla, a remarkable young man from the United States who I happened to cross part of the Sahara Desert with last April donated money for a goat. And here’s the goat and the child who received it. This is Peter Katana who is a recipient of Andy’s donation. Just an interesting note – we’re talking to Andy about spending some time up in Kikima in the upcoming year, teaching at the school and living on the grounds of the children’s residence. 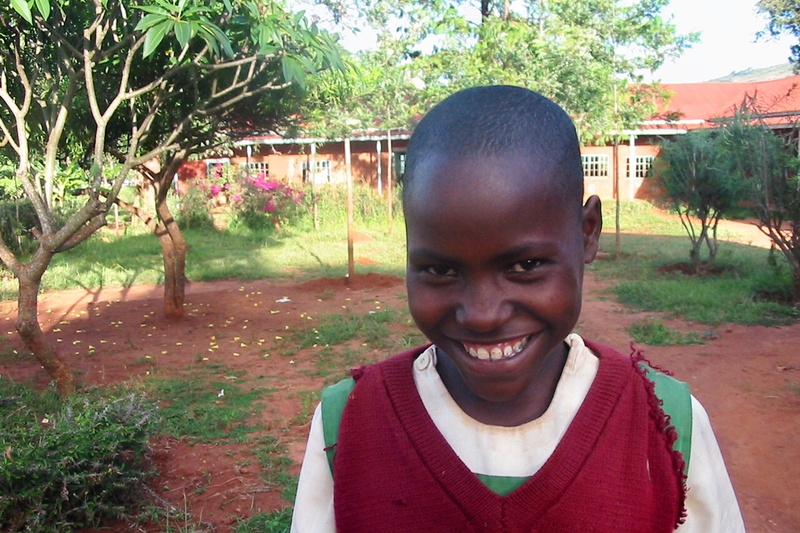 The school year in Kenya starts in January. The determination of whether a student can go to high school, or what level of high school, is made through a series of tests that are taken in November. 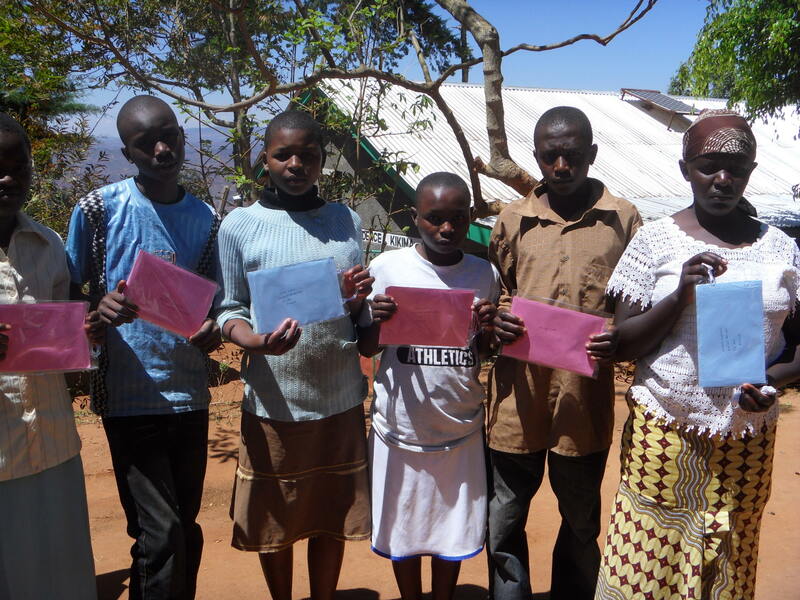 Letters of support, along with small presents were forwarded to some of these children from their sponsors. Unfortunately, along with marks there must be fees raised to pay for high school tuition. We have eleven young people either returning to high school or hopefully entering high school in January. It is estimated that we will have to raise approximately $3000.00 to provide for tuition. We have two fund raisers that are helping to provide for these fees. Julia continues her Cans for Kenya Campaign at University of Guelph. Through the first two months – collecting empty cans and bottles at the university – Julia and her team have raised $350.00 – which includes an individual donation from alumni Anita Davidson, of Bass River Nova Scotia, of $200.00. Halloween was also the occasion for one of our sponsors, Kelly and Chris Betts to host a party with proceeds going for two purposes – to buy a cow for their sponsored child, Eric – and to help pay tuition fees. Here are Kelly and Chris, dressed as a very unfortunate bride and groom, at the Halloween party held in Toronto at Lou Dawg’s Grill House on King Street (www.loudawgs.com) Special thanks to Sean Smith, the owner of the club and to Daryl D’Souza who was responsible for all the marketing for the event. There were close to 100 people in attendance and all made donations; the final total raised by the Halloween party was $1622.00. 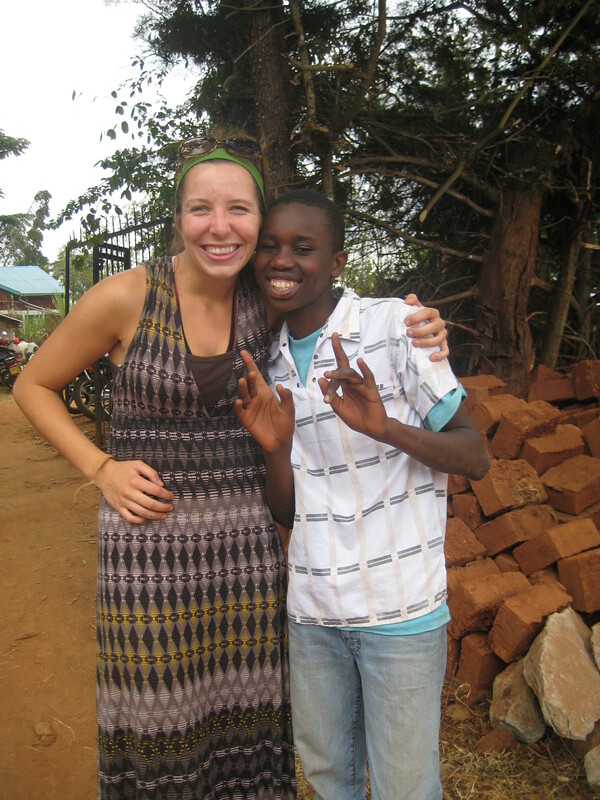 This money is being used to buy a cow for Eric ($300), and to pay for high school tuition for Faith ($320), Sarah ($510) and William ($320) with the additional money going into the pool of funds being gathered for the remaining 8 students who will need to have their tuitions covered. Leaves Fall Down – Funds go up! For the second year Ryan Rumsby has had his students at Prince Philip rake leaves to raise funds for our programs in Kenya. 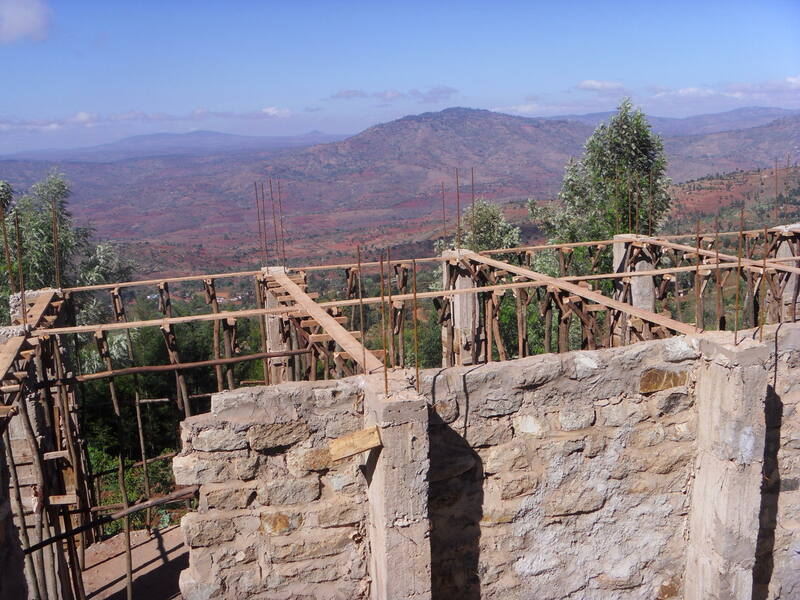 Previously they have raised money to construct a water project, build the goat academy and the class also sponsors Naomi on an ongoing basis. As well, Ryan and his wife personally sponsor a second child. 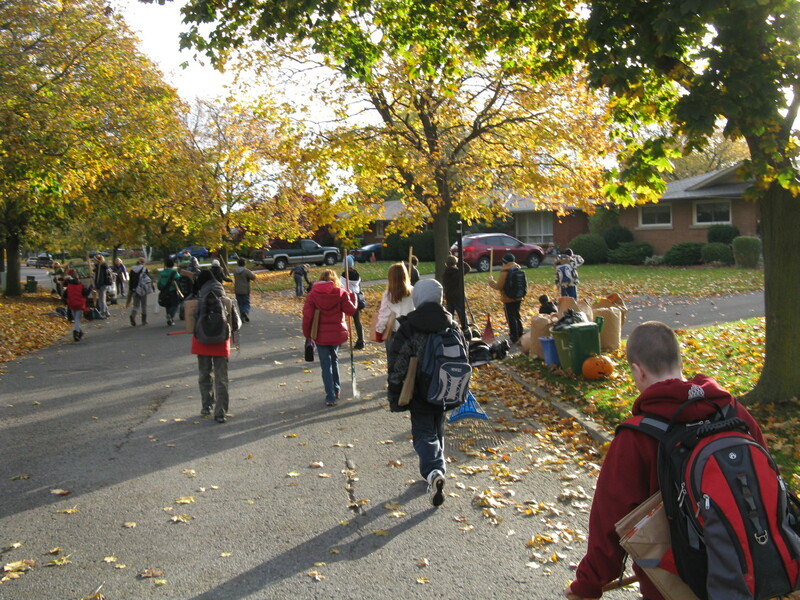 The class goes through the neighborhood offering their services to rake leaves – allowing the home owner to decide the amount he will pay for the service. The money raised through these efforts are the direct result of the work done by the children – they are earning the money to help others. 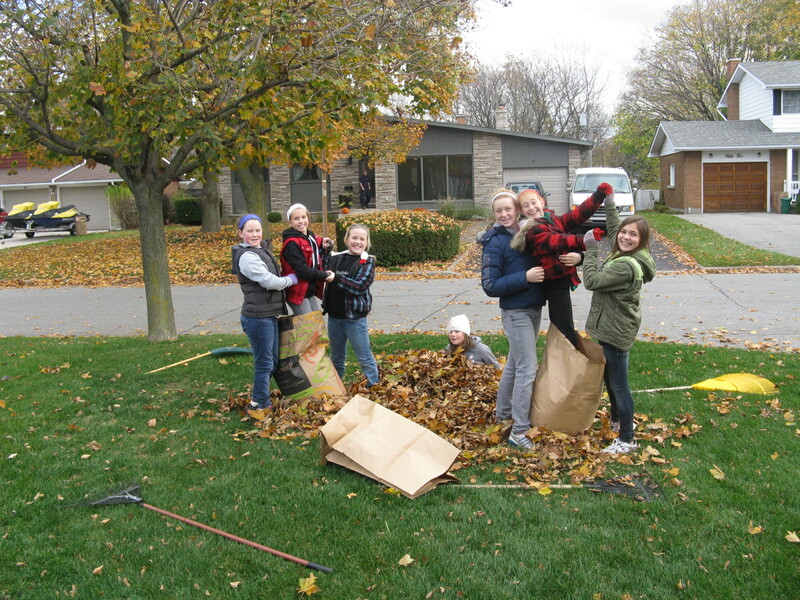 The students went out and raked leaves and have thus far raised $532.00, which includes $40.00 that Mr. Rumsby donated from refereeing volleyball games. Mr. Rumsby’s class is continuing to raise funds through their efforts. They will also be given the opportunity to help decide how the money will be spent. We always like it when students write their impressions. Here is one of the students, Jesse, writing about this experience. These are her words, unedited, unchanged. You are very right when you say we are lucky that we have the privilage to be lasy. In fact I probably use that privilage far too often ( That’s what my parents tell me all the time ). But I probabaly shoujld be much more thankful to have that privilage, i actually should be much more thankful for A LOT ( oh ya i got it 🙂 ) more privilages that i don’t think is a very big deal. But as a lot of people say: you can never really appreciate something until ot is gone. Well I think that everyone can agree that today was a great sucess. Raising about $500 is quite the accomplishment if i do say so myself. There were many benefits that came out of this experience. 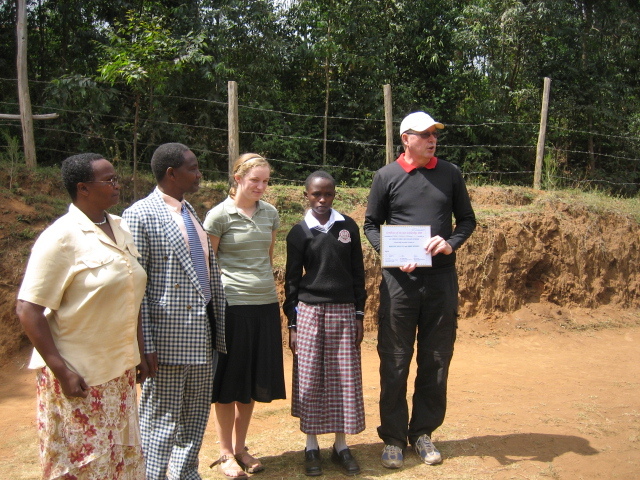 Obviously the most important was that we were helping all of those villages in Kenya. I think that the money that we raised will not only help the people in Kenya with their village and living conditions, but it will also give them hope to know that other people in the world are doing their best to help them and other people in the world to make the world a better place. Not only were we helping the people in Kenya but we were also helping the people in the community in many ways. 1: we were helping them rake leaves so they wouldn’t have to do it all by themselves. 2: We were helping a very nice lady get her husband to buy her a lovely dinner. 3: We were also teaching them that even though people are going through hard times, these 30 kids ( and 1 teacher ) are working to make a difference in the world no matter how hard it takes. It might also help them realize the hardships that these people in Kenya are facing and they also might want to take a stand and help them themselves. Not only were we helping the people in Kenya and in our community we were also helping oursleves as individuals. I’m sure that when we were all finished with the raking everyone was relieved. Not only because nobody was going to be getting anymore blisters on their hands or complaining about how sore their shoulders were and actring like complete seniors ( no offence seniors ), but when we were finished I also felt a sense of accomplishment. Noing that even though it was not much, we took a stand and helped the world become a better place, something that not many people can say. There were many lessons that I learned in this experience. One of these was that by doing just the smallest thing will be making so many people happy. Seeing the smiles on some of our cosumers faces when we told them what we were doing this for was such a reward. Not only for me, but for them as well, because they are able to go to sleep at night thinking that somebody in this world is trying to help. Secondly I learned how great it felt to do something this large just to make other people in the world felt. It was amazing. Sure I might have done something nice for other people. But not this suggnifigent. I might have bought a friend something at the snack shack, but really there was no reward after. With this I felt almost extatic to think about what I am doing and who I am doing this for. Thirdly, I learned a very importnat lesson. That is that: I might have done small things for other people but nothing huge, and that is probably the same for most of my friends. I think that there is a reason behind that. I think that we may not have been able to do things like rake leaves and things like that because we haven’t ever been giving the opportunity. I am not saying that just because we haven’t been told to that we shouldn’t do it, all I am saying is that maybe if we had of been given the opportunity to do things like this earlier than alot more things would have been done. That is what I am loving about this class. Even though it is not in the curriculum, we are learning about it anyways, being shown how to make a difference and finally truely understanding the reality of things. Maybe we shoulod have been tought these things earlier so that we could have done even more. Of the many evolving and wonderful patterns has been Kenyans rising up to help their fellow Kenyans. 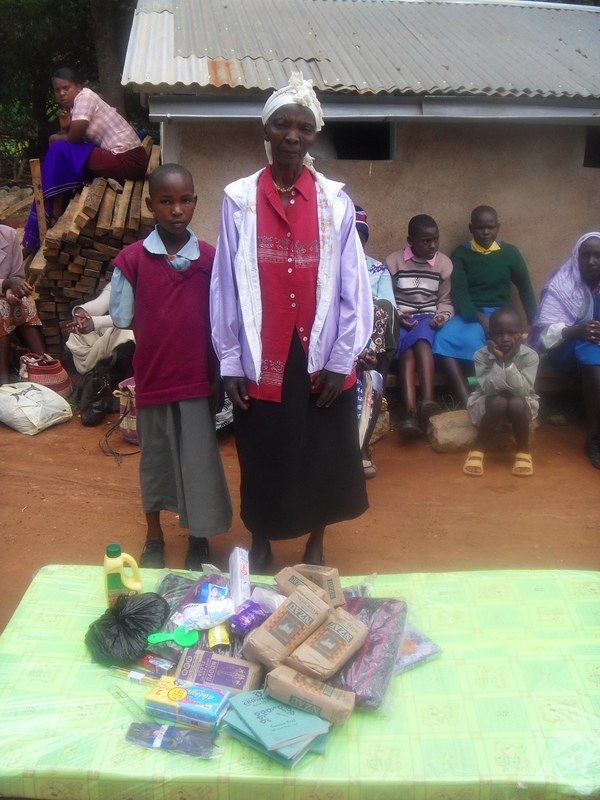 Ruth reports that the churches in Mbooni district are now ‘competing’ to raise funds for The Creation of Hope. As of the last collection period they have raised $5710.00! This is through the tens of thousands of people in the 109 churches making donations three times a year. This amount, from people struggling to make their own daily needs for food and shelter, is an amazing sign of charity and compassion. The local people take pride in helping the orphans amongst them and are so greatly encouraged by the donations that come from Canada. 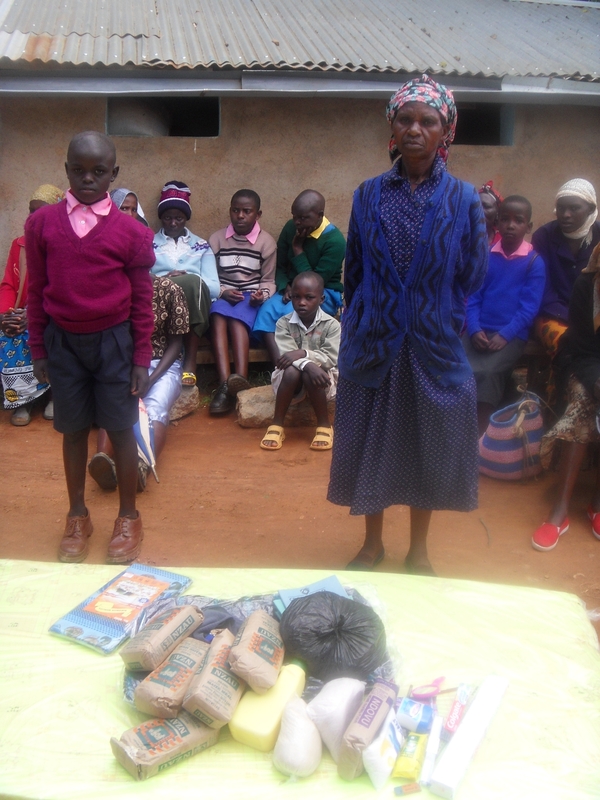 In addition our Kenyan sponsors continue to sponsor children, bring up medicine, clothes and food, and donate windows, doors and bricks for the expansion. Ruth estimates that their contributions have been worth over $3000.00! 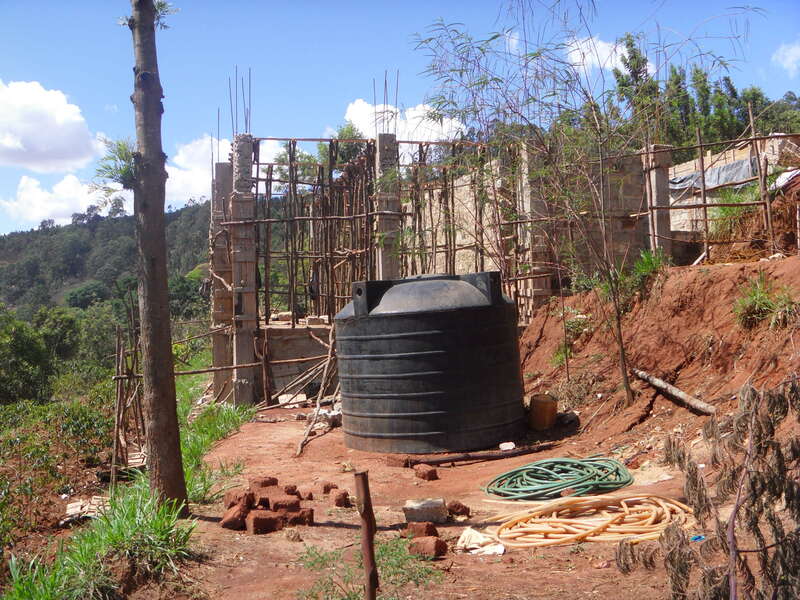 In the September/October period over $2300.00 of the building expenses were provided from these local Kenyan sources. We are truly building a partnership! The following is money spent in September and October for ongoing expenses and building costs for our expansion. Most of the funds spent were on the expansion – which is an incredible undertaking that will form the basis not only of the residence but the entire outreach program throughout the region. Here are some updated pictures of the construction. This is a three level structure built on the side of a mountain and is being constructed in such a way that it can be easily and safely expanded to become three times as large if funds and need warrant that in the future. This view – off the side of the mountain with Mbooni District in the distance is truly inspiring. 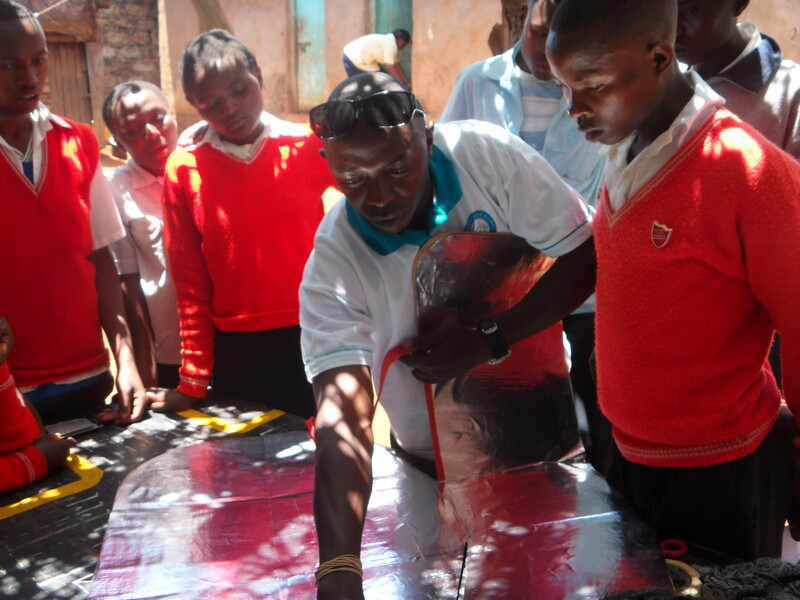 As inspiring as those schools that have raised money to make this possible. Funds provided by Cupar paid for the following September expenses: night watchman $46.00; medical treatment for children both in Rolling Hills and in the community programs, $70; the matron, $108.00; nursery school costs, $42.00; personal care for children, $17.00; communication/air time, $35.00 and extra food costs for food distribution, $125.00. Funds provided by Southey for October expenses; night watchman $46.00; matron, $108.00; tutor for two month period, $77.00; additional costs for food distribution, $120.00. Food distribution gatherings are massive events with over two hundred people in attendance. Some of the orphans and their guardians are travelling long distances and we have provided transportation costs for them to come to the ceremony and then return home carrying their food packages. 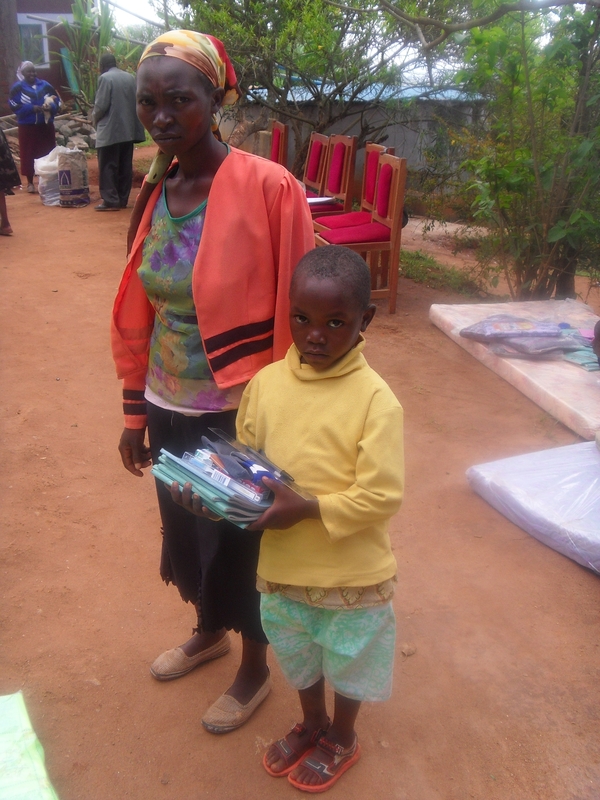 In addition those receiving blankets and tool sets have also been provided with transportation. The cost for this transportation over the September and October distribution was $152.00 and was funded by Highland Secondary School. The final costs of well construction included a cover for the well and additional pipes. This totaled $96.00 and was provided with funds from Rolling Hills. Labor: $1385.00 funded as follows; $300.00 from Cupar, $385.00 from Southey, $350.00 from Highland and $350.00 from Rolling Hills. Ballast: $237.00 from Cupar, and $310.00 from Rolling Hills. Funds provided for sand and lorries to transport material cost $369.00. This was funded by Highland. Building blocks used during September cost $538.00 and were paid for by funds from Rolling Hills. In addition funds from Rolling Hills paid for additional brick making, $31.00, fuel costs associated with construction, $38.00. Water: This is the last time water will have to be ‘purchased’ and trucked in now that our well is functional. The cost for water for construction and ongoing use for the Rolling Hills children was $515.00; this was funded by $268.96 from Southey (the last of the money they raised), $167.77 from Highland; $83.00 from Rolling Hill (the last of the money they raised) and 0.27 from Cupar (the last of the money they raised. As of the end of October there are only five schools with funds that are still not designated. We still have $600.23 of the money donated by Highland that is yet to be spent and $652.20 from Rolling Hills students, Darby and Ehren who held a bake sale and Mariah and Sarah who held a bottle drive, along with the three donations this month from Vaughan Willard P.S. $257.34, Sir Winston Churchill P.S., $679.79 and St. Benedict, $135.99. That’s it for the October update. Thank you to all who are interested in reading through the details and learning how our project is evolving month by month. This month, we have included another country into our sponsor community, welcome Wanjiku Njoroge of the USA! It’s amazing how new connections are being made and the results are just miraculous. Nzisa Wayua is 12 years old. Her exact date of birth is not known. 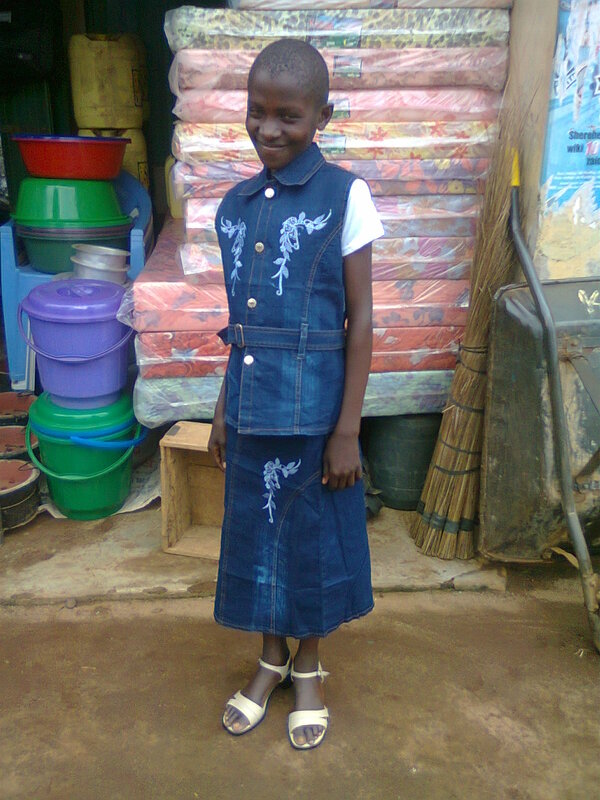 She is in standard 5 and in her last exam, she was position 2 out of 14 children in her class. Her mother passed away in 2006 from an illness. 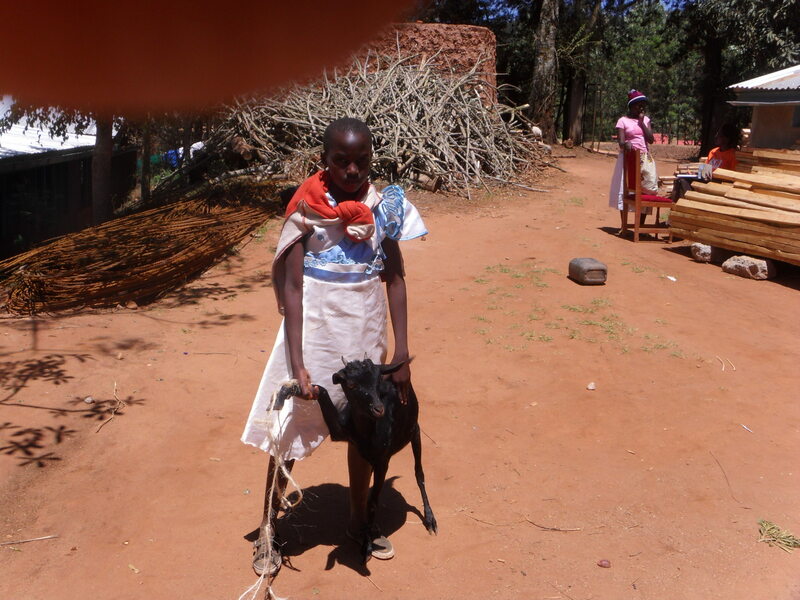 Nzisa lives with her 70 year old grandmother, her 2 older sisters and 1 cousin. On their ½ acre piece of land, they plant maize, beans and peas. The grandmother depends on her son to provide for this family through casual labour. She is also blind in one eye. They live in a weak brick and iron sheet roofed house. 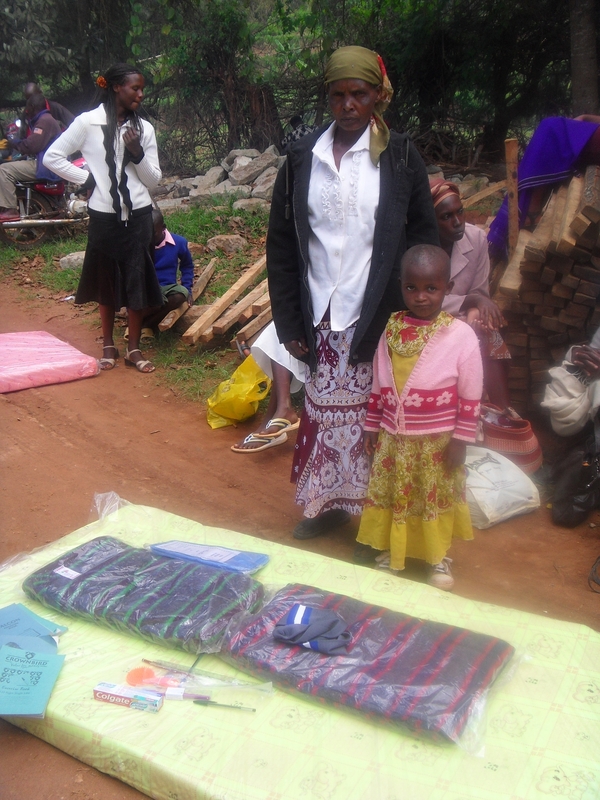 Nzisa sleeps on the ground using some old rags as a mattress and has a tattered blanket and sheet. When her sister is away in boarding school, Nzisa sleeps with her grandmother on her bed. Kilinda Nyelele is 7 years old. His exact date of birth is not known. Both of his parents died in 2006 from Tuberculosis (T.B.). They were married. He is in standard 1 and in his last exams, he was position 3 out of 10 kids in his class. He lives with his grandmother and his elder brother and sister. On their ½ acre piece of land, they grow maize, beans and peas. He also has 1 goat. The oldest boy is the one who looks for casual labour to support the family as the grandmother is too old to work. Kilinda shares a bed with his grandmother and they have 2 old and dirty blankets. 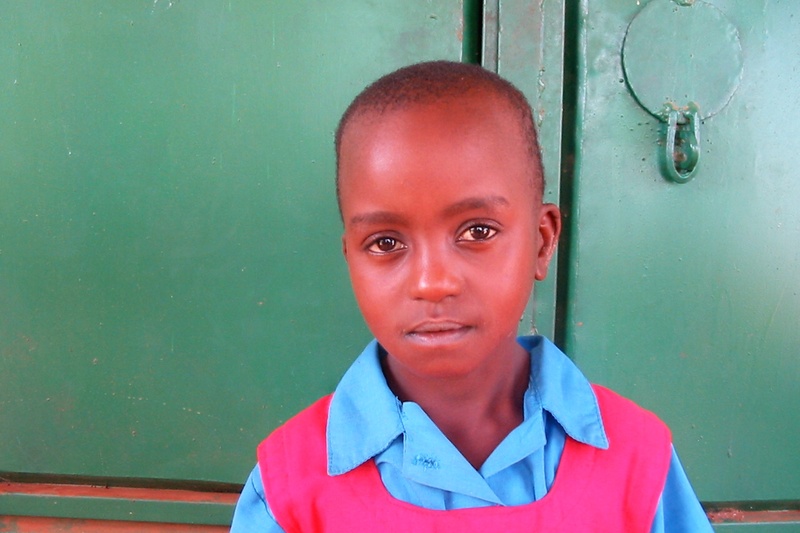 Mwongeli Syokau Muinde is 6 years old, her exact date of birth is unknown. She is in standard 1 and in her last exam, she was position 26 out of 44 kids in her class. Her mother passed away in 2005 from malaria. She lives with her 52+ year old grandfather, 2 cousins and her older sister. 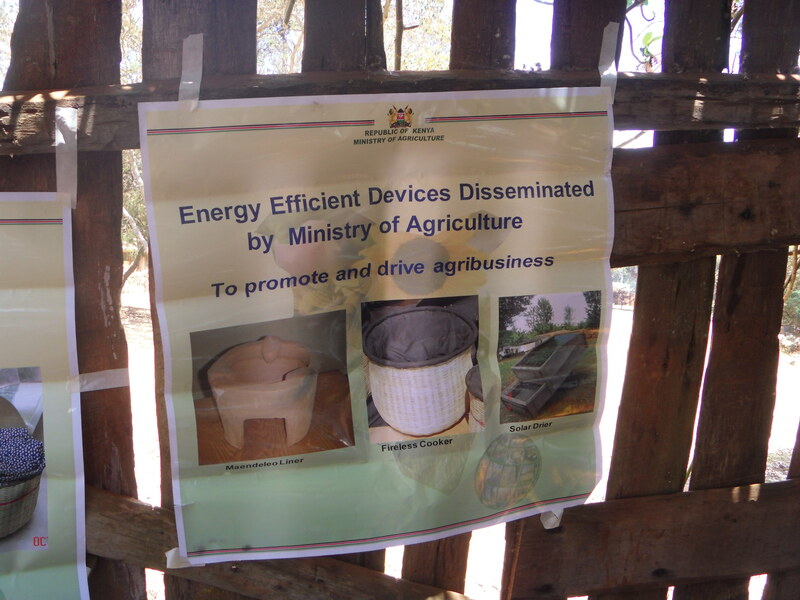 On their 1 acre piece of land, they grow maize, beans, cowpeas and millet. They also have 2 cows, 1 goat and 1 chicken. The grandfather earns about $ 17 from farming and livestock. Their house is made of brick and iron sheet roof, though it leaks when it rains and some of the iron sheets have rusted off completely. Mwongeli shares a bed with her sister. They sleep on the dirty ground and use sacks as a mattress and dirty clothes as blankets. She also has body rashes and ringworms. Mwau Mumbua is 7 years old. His exact date of birth is not known. He is in standard 1. His mother passed away on 13th January, 2009 from an illness. His mother was traditionally married but later divorced Mwau’s father. Mwau lives with his 81 year old great grandmother and his standard 5 sister. On their 1 acre piece of land, they grow maize, beans, peas, pumpkins, avocadoes and mango trees. 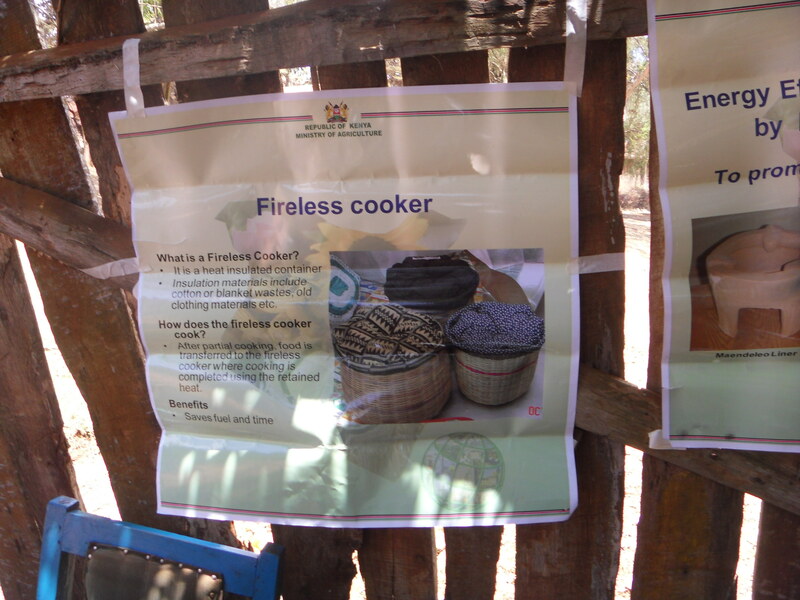 Their livestock died during the last drought the country experienced. The great grandmother earns a living from burning and selling charcoal and weaving and selling sisal ropes. Their house is a weak brick and iron sheet roofed structure. 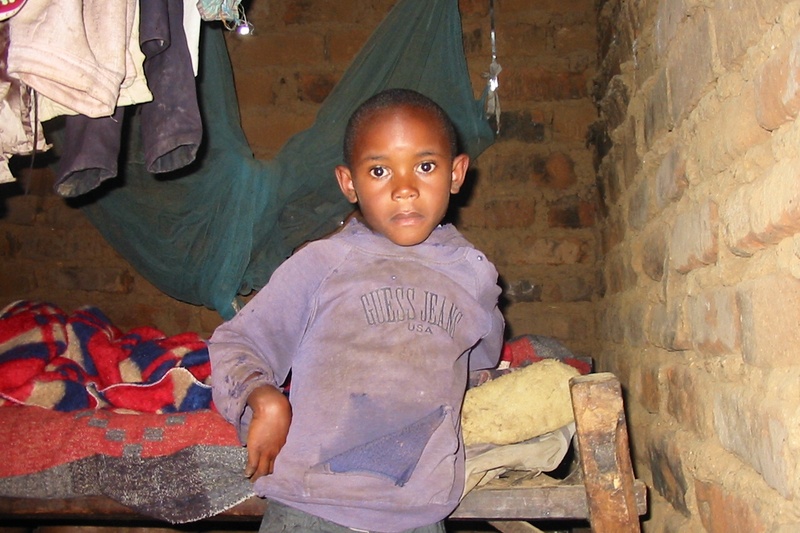 Mwau sleeps alone on a roughly constructed bed that has no mattress or sheets, he uses rags to cover himself. He suffers from ringworms. 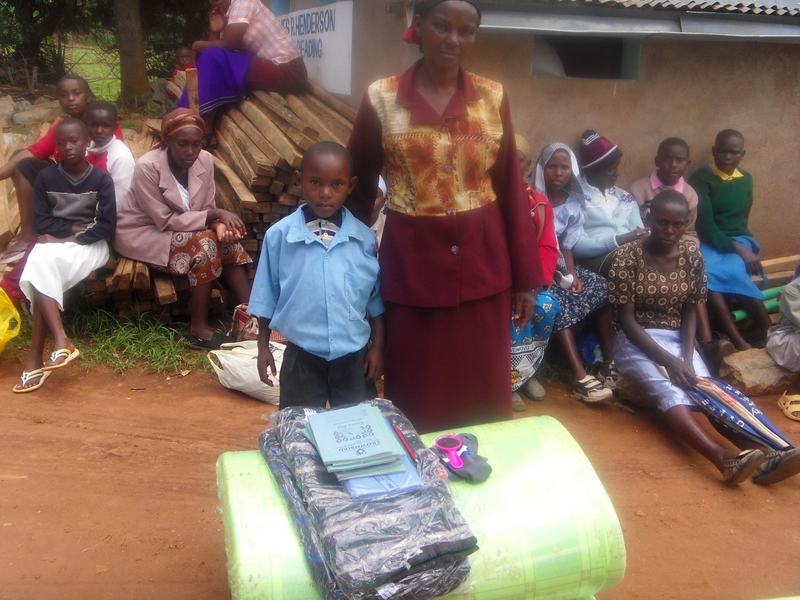 His wish list includes school fees, school uniform, shoes, clothes, beddings, medical care, food, a bed, mattress, and shelter. This can be fulfilled with a $140 donation. 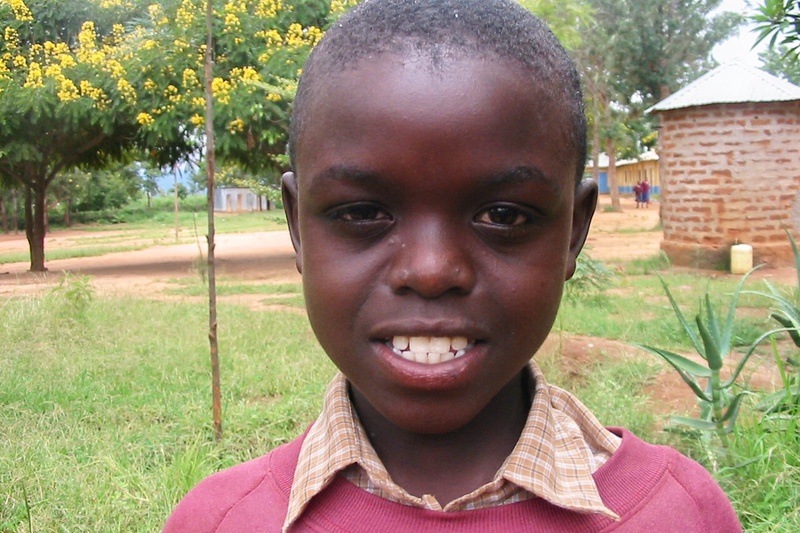 Baraka is a resident of Exodus Childrens Home, which is run by a remarkable young man called Elijah. 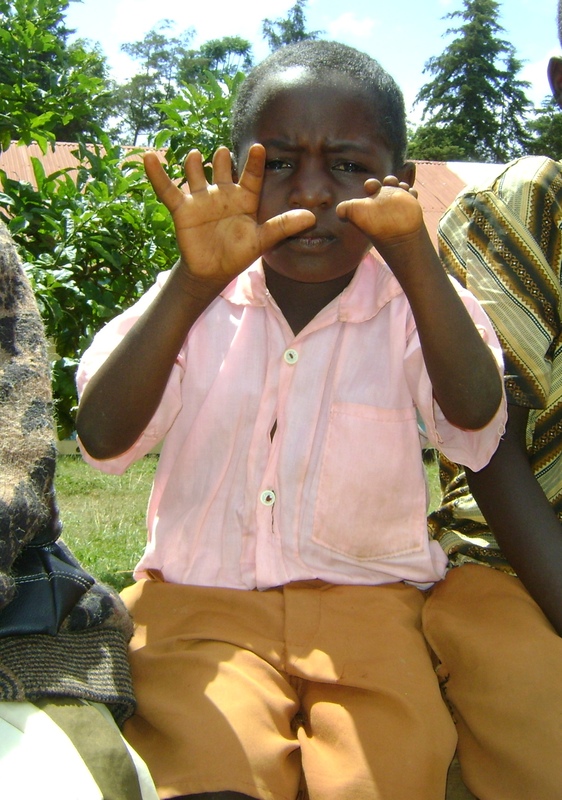 When he was born, Baraka’s mother abandoned him because of his deformed hands, thinking that he was a curse on the family. His grandmother rescued him and took care of him until Elijah took him in. And now, together with Megan and Julia, Baraka has been given the opportunity to defy all odds and make a success of himself! Lorraine Toma-Jones granted two wishlists. One was for Koki Mwikali, on behalf of Tom and Bea, whose hearts would be broken watching children suffer and the other for Mwongeli Mumbua on behalf of Vickie Nerino, thanks for the treat of witnessing such unique creativity. 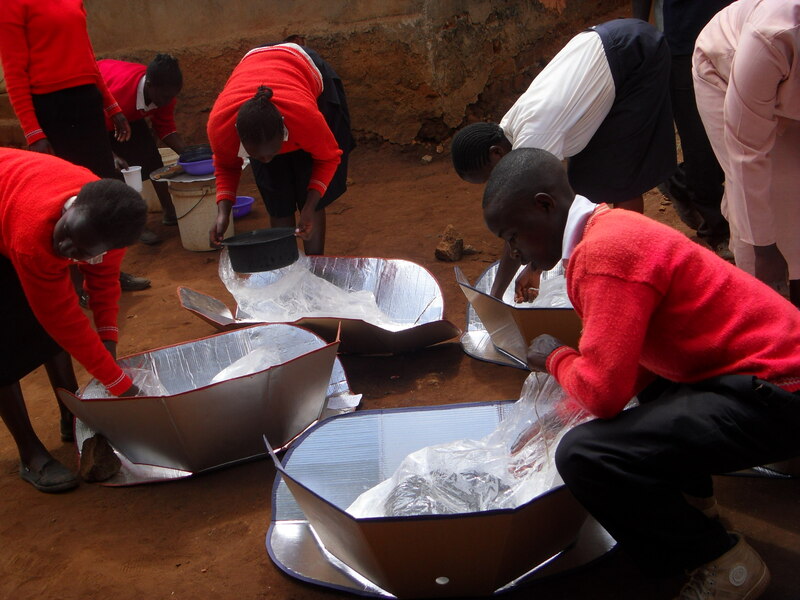 We were also lucky to have Faustine Odaba and her son come for two days to train us on solar cooking. 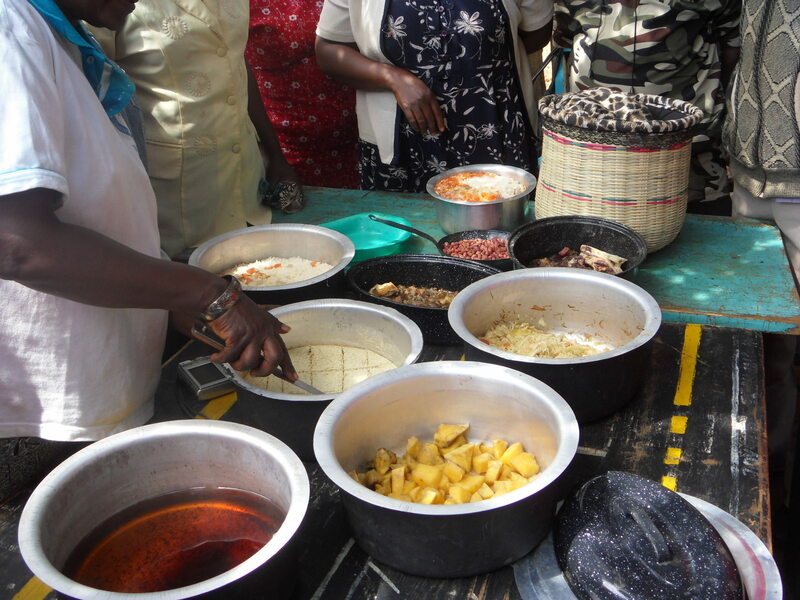 We made some yummie food (as evidenced by the pictures) and learned a lot about solar cookers, fireproof baskets, recycling of plastics and eater hygiene. 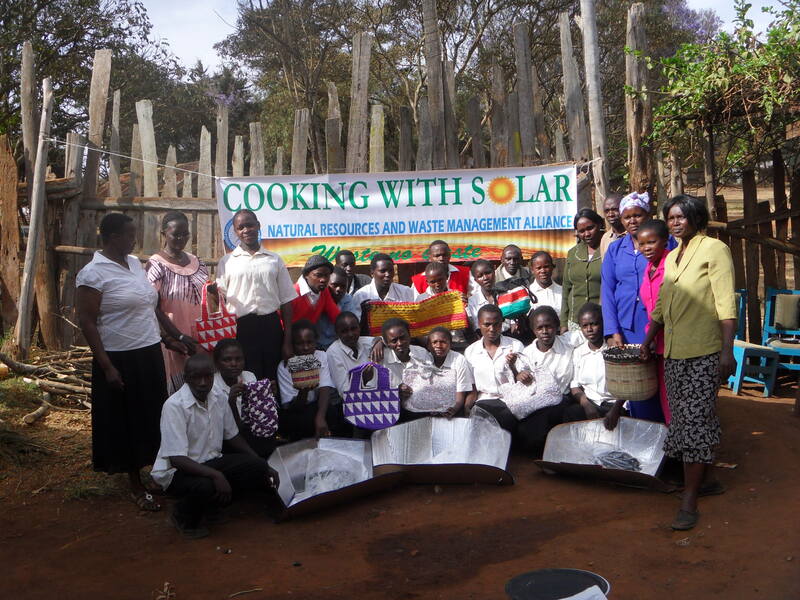 The timing of her arrival coincided with her being the first and the only person outside the United States to win the Order of Excellence Award for her unrelenting efforts over 15 years to get solar cooking technology adopted worldwide. And finally, a tribute to my brother, Danson, who has been working quietly in the background consistently rewarding the kids within the program who come first or are the most improved in their exams. Therefore, I have no idea whether the childrens improved performance is as a result of this incentive or better learning. Either way, thanks bro! This month was full of so much activity I could barely keep ahead of all the good will flowing in! Kanini Beth was born on 24th May, 1997. She is 12 years old and in class 4 and in her last exams, she was position11 out of 47 kids in her class. Her mother died 2 months after she was born from stomach problems. She was not married. 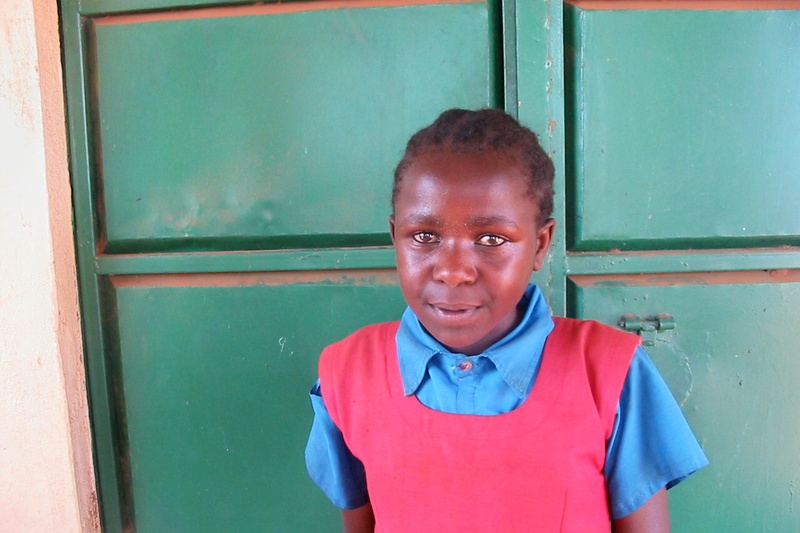 Kanini lives with her 55 year old grandmother and 7 cousins. They plant maize, beans and peas on their 1 acre land. They also have 1 goat and 1 hen. 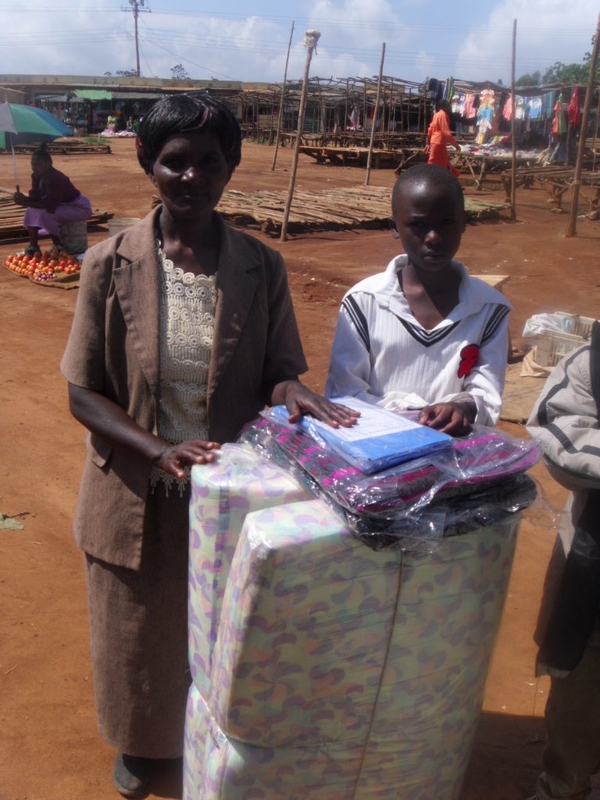 The grandmother gets some financial support from one of her elder sons. Their house is made of mud and grass thatch. 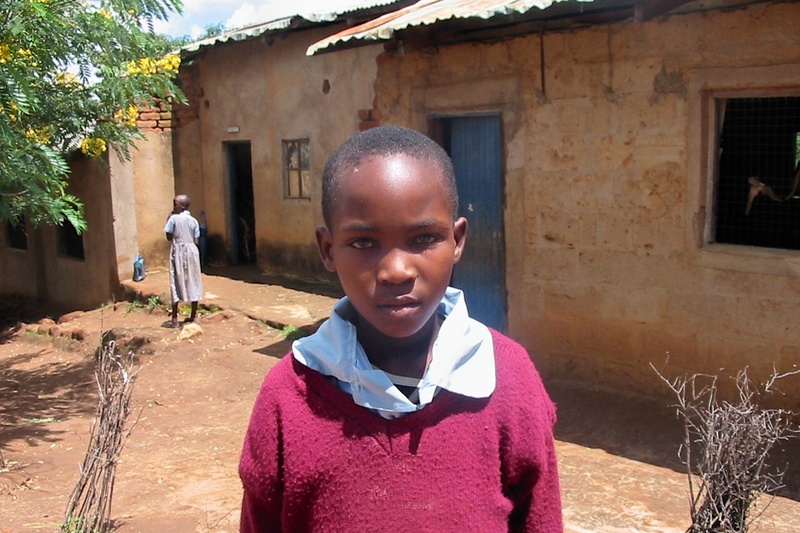 Kanini shares a bed with 2 of her cousins and her grandmother and they have inadequate beddings. She also suffers from a chest problem. They also provided funds to grant her wishlist. Kioko Nzembi is 13 years old, his exact date of birth is unknown. His mother passed away in 1997, the same year he was born, from cholera. She was not married. He is in standard 5 and in his last exam, he was position 16 out of 24 kids in his class. He lives with his 70+ year old grandmother and 3 cousins. On their ½ acre piece of land, they grow maize, beans, cowpeas and sorghum. They also have 2 goats, 1 cow and 1 chicken. The grandmother earns $ 13 per month from farming and weaving. 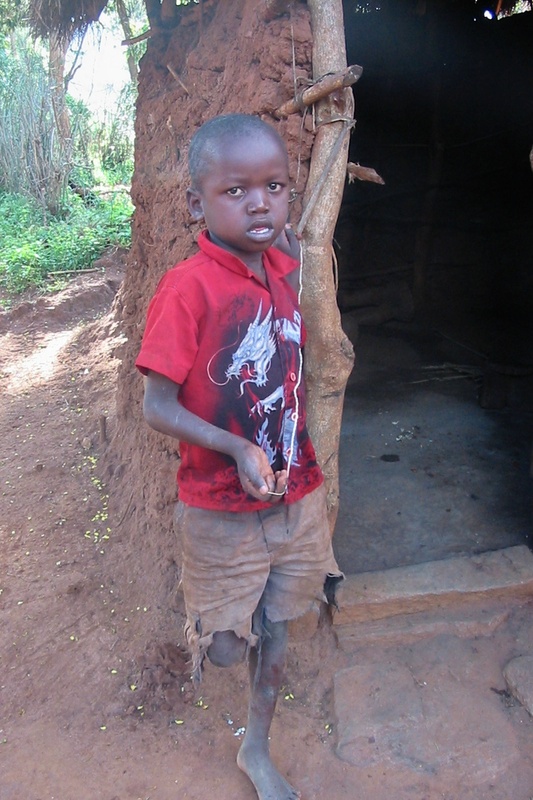 They live in a brick and iron sheet house and Kioko shares a bed with one of his cousins. They have an old torn blanket and sheet and dirty mattress. He also suffers from ringworms. They also provided funds for his wishlist. 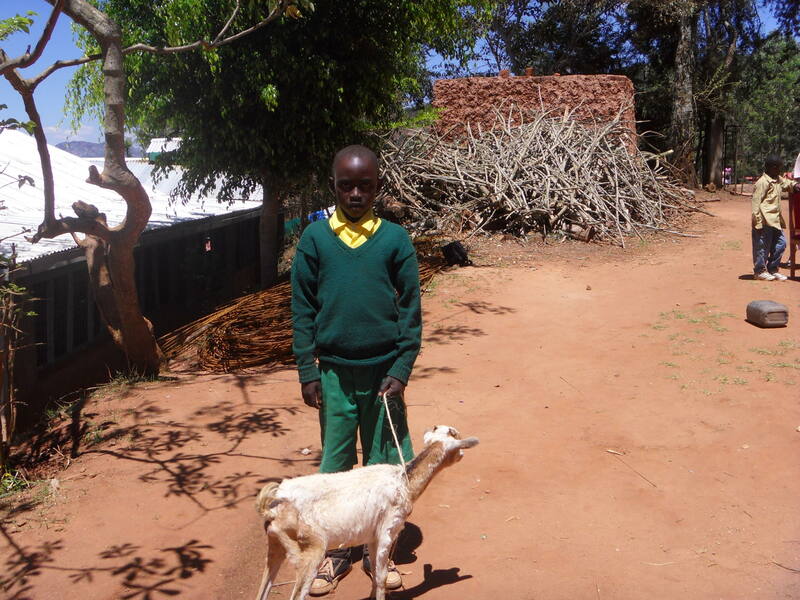 Mbithi Mutheu is 8 years old. His exact date of birth is unknown. His mother was not married and she passed away in 2006, the same day as her sister (mother of one of his cousins) at the age of 19 years, both from HIV/AIDS. He lives with his 30 year old aunt, her 3 children and 1 cousin. He is currently in standard 1 and in his last exams, he was position 15 out of 24 kids in his class. On their ¼ acre piece of land, they grow maize and beans and they have 1 goat and 3 kids. The aunt earns a living from doing casual labour and weaving and selling sisal ropes. They also get some assistance from kind villagers. Their house is made of brick and iron sheets but it is very weak. 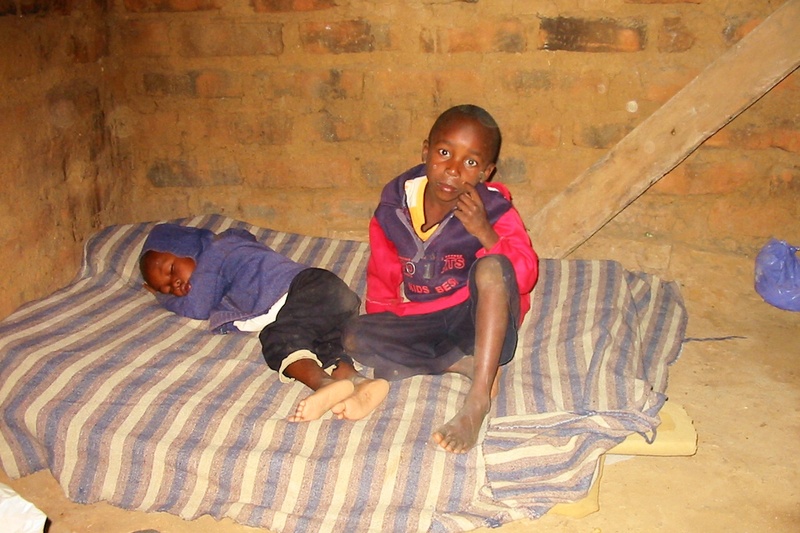 All 5 children sleep on the same bed which is broken with old blankets. The aunt sleeps on a long chair next to the bed. Mbithi suffers from ringworms. They also provided funds for his wish list. Ian Syombua was born on 10th June, 2003. 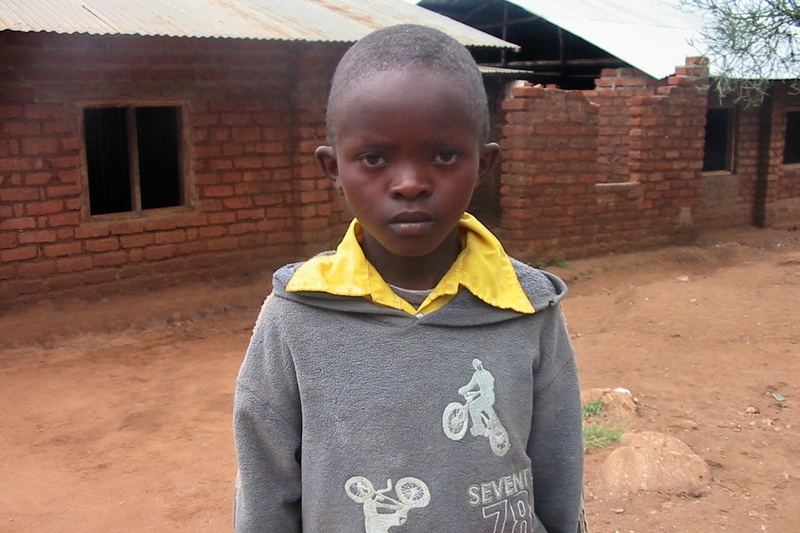 He is 6 ½ years old and in standard 1 and in his last exam, he was position 5 out of 10 kids in his class. His mother died on March 2009 from stomach problems. He lives with his 47 year old grandmother, his 2 ½ year old sister and 2 uncles who are still in high school (grade 10). On their ½ acre piece of land, they plant maize, beans, peas and millet. 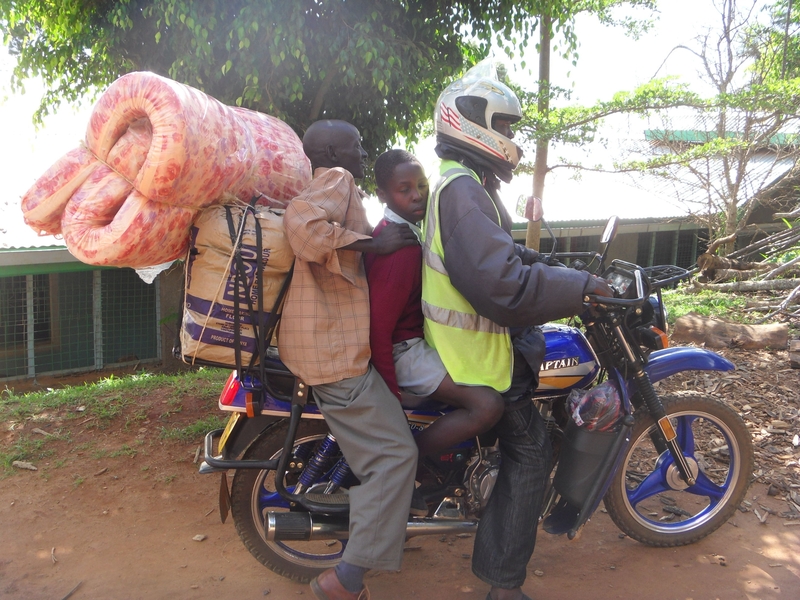 The grandmother earns about $ 20 per month from casual labour and is also helped out by an older son who is casually employed in Nairobi city. They live in a brick and iron sheet house and Ian sleeps on a mattress on the ground which he shares with one of his uncles. She also provided funds to fulfill his wishlist. 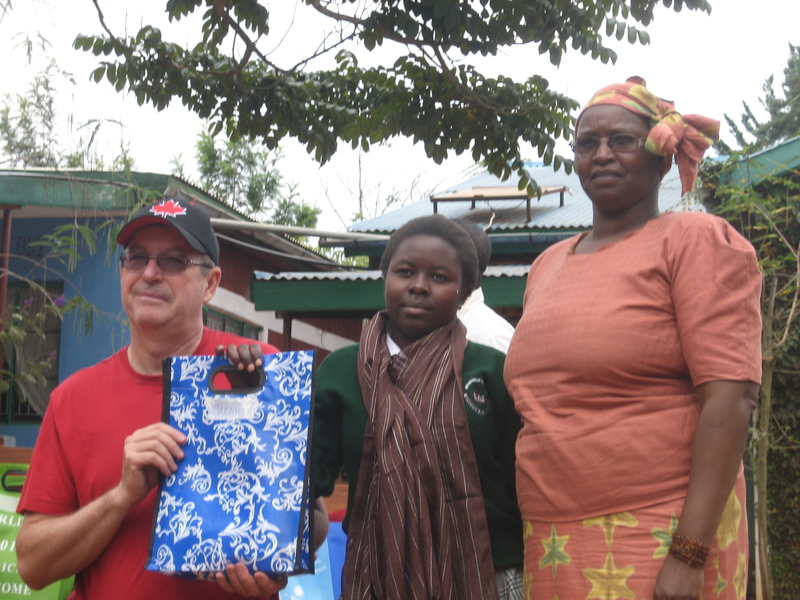 Emily Dawber granted Musyoki Mueni’s wish list as a birthday gift to her sister, Kate Dawber. Eimi Kawamura, all the way from Japan, granted Mary Kanini Kamene’s wishlist. Sara Tillet granted Kilinda Nyelele’s wishlist. Eric Walters granted the wishlists of John Mbuvi Ndulu and Muema Mbinzi through royalties from Penguin Books. 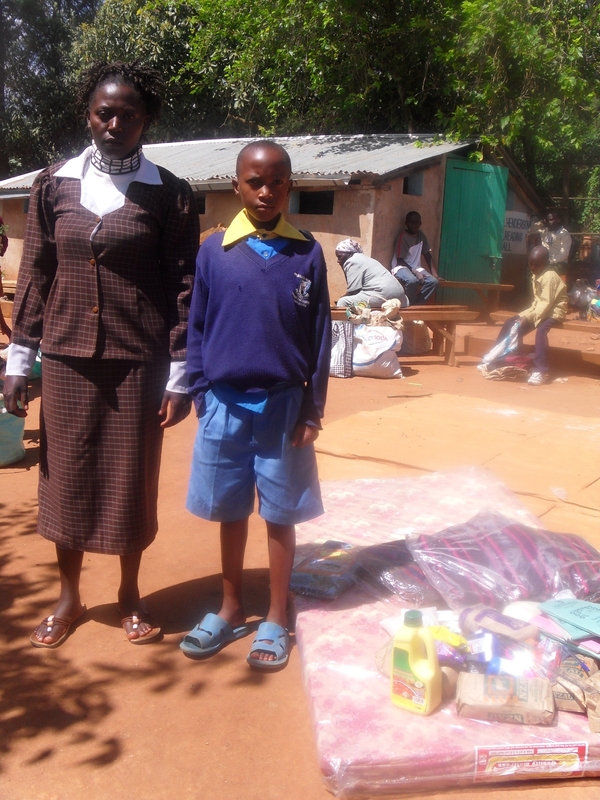 In lieu of a Christmas gift, Valerie Bullock donated her money towards Mueni Kanini’s wish list. This year has been amazing, in terms of sponsorship and granted wishlists. Another year like that and I doubt we shall have a single orphan left in Mbooni! Thank you to all the individuals and institutions that made it all possible. We wouldn’t be where we are without all of your support. To close the year for us, we had three new sponsorships and a granted wishlist. 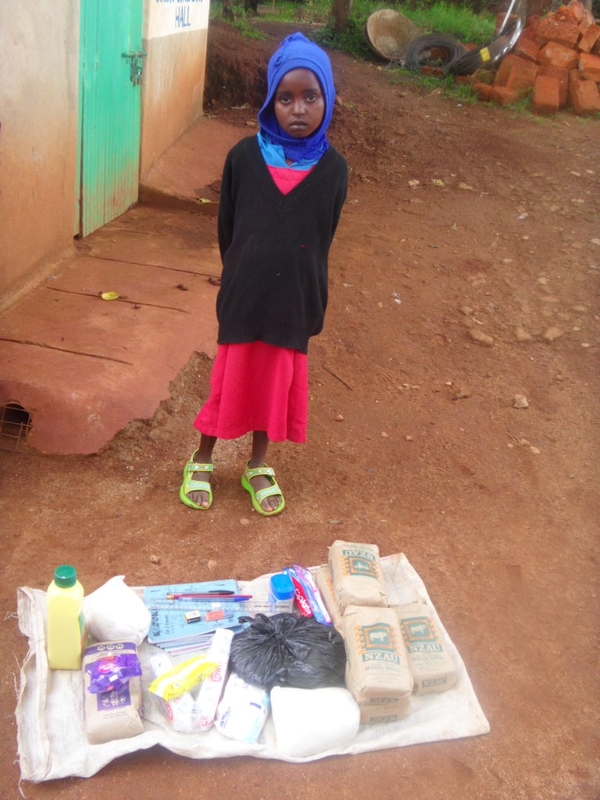 Mueni Kanini is 9 years old, her exact date of birth is not known. She is in standard 2 and in her last exam, she was position 27 out of 50 kids in her class. She lives with her 56 year old grandmother and her 4 siblings. Her mother passed away in 2009 at the age of 29 years due to severe bleeding during child birth. She was a house maid in Nairobi City. On their 1 acre piece of land, they plant wheat, peas, maize and beans. They also have 1 calf and 5 goats. On a good month, she earns $ 17 from her farm when the yield is good and from casual labour (she works side by side with the children). She sometime gets support from relatives. They live in a mud and iron sheet house. Mueni sleeps on a mattress laid on the chairs in the sitting room. She shares this with 1 brother and 1 sister. They have only 1 blanket. Koki Mwikali is 10 years old. Her exact date of birth is unknown. Her mother passed away the same year she was born from typhoid. She is in standard 4. In her last exam, she was position 6 out of 24 kids in her class. She lives with her 64+ year old grandmother, 2 cousins and her older sister. On their 2 acre piece of land, they grow maize, beans, cowpeas and sorghum. They also have 4 goats. The grandmother earns an income from farming, weaving and selling baskets and rope. She earns about $ 42 per month from this. 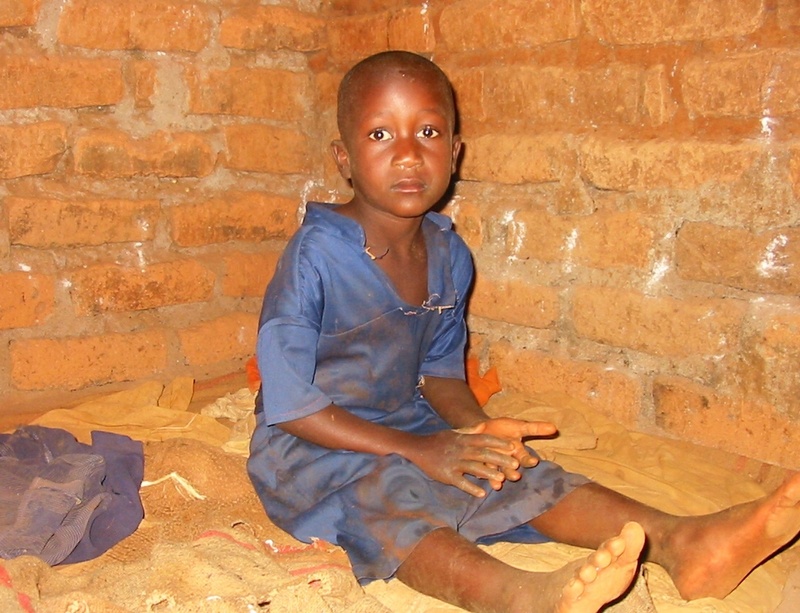 They live in a brick and iron sheet house and Koki shares a bed with her grandmother. They have a broken bed, a torn mattress and old beddings. 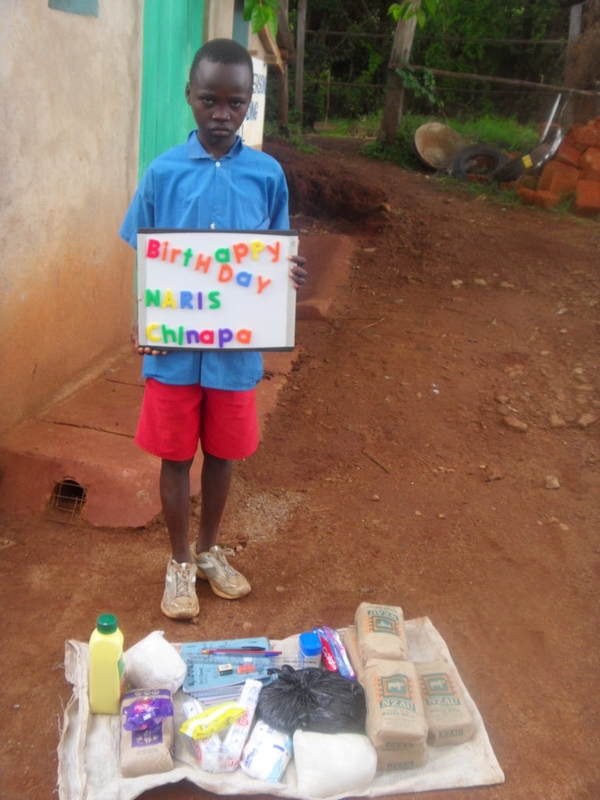 Muema Mbinzi is 11 years old. His exact date of birth is not known. His mother passed away on 21st August, 2008 at the age of 36 years from cancer. She was married but divorced early 2008. He is in standard 3 and in his last exam, he was position 41 out of 44 kids in his class. He lives with his grandparents and 3 cousins. According to neighbours, his mother passed away because no one was concerned about her or her health except for her mother, who used to buy her medicine whenever she could earn some extra money. The grandmother is the only hope these children have. On their ½ acre piece of land, they plant maize, beans, pigeon peas and sorghum. They earn an income from farming other peoples land for a daily wage. Muema sleeps on the floor with an old dirty blanket with which to cover himself with. He also suffers from ringworms.